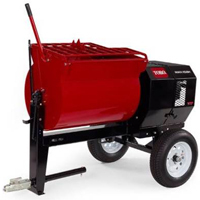 The Toro MMX mortar mixer offers contractors an extreme-duty mixer that features a unique drum profile and patented paddle configuration to mix mortar more quickly and completely than other mixers. Great for job sites where time is critical or for specialty mix applications.Tow poles sold separately, choose from three tow pole options, pintle, stamped, forged. Heavy-duty all-welded grate with a three point bag splitter. Innovative drum design eliminates the dead-zone for 30% more paddle contact with the mortar. Extra thick rubber paddle wipers for longer life and better performance. Removable bearing and seal housing for easier servicing.